SHOP FOR QUALITY BIRD CAGES ... We Have the Best for All Species of Birds! ... browse beautiful bird cages to your heart's content! Super selection of bird cages for a great variety of the most popular and highly desired styles available today. You'll discover quality parrot bird cages manufactured by A&E, Avian Adventures, HQ, Featherland and more. 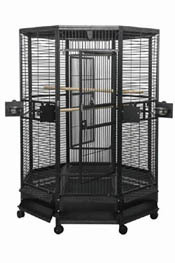 We can also provide Kings Cages. 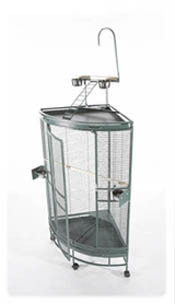 We have other styles of pet bird cages such as indoor and outdoor aviaries. There are even a few excellent choices for primates and sugar gliders. Check out the Bird Cage Size Guide as a good place to begin in selecting the cage appropriate for your bird. 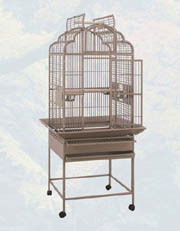 Whether you are looking for the ever popular wrought iron bird cage in a dome top or playtop bird cage, or special designs such as: flight bird cages, double bird cages with dividers, space-saving stackable bird cages and corner bird cage styles, decorative bird cages in Victorian and furniture-cage styles, spacious hexagons or octagons, or the much-desired stainless steel cages, you'll find them here. If you are in need of a small bird cage, medium bird cages, or perhaps a really big bird cage BirdCagePortal has them all. Enjoy our discount prices and free shipping ... fast delivery ... superior and friendly customer service ...and secure website offering you a great shopping experience. You'll discover that we sell our bird cages for less than a brick and mortar store! Discount bird cages -- every one of them! The best bird cages at the best prices are available right here and you'll receive them quickly. Choosing the right cage means selecting a quality cage ... the only kind that will provide your bird the home it deserves. You'll discover as time passes that you've made a smart investment. Give your bird the advantages of full-spectrum lighting for proper nutrition, beautiful brilliant feathers, an optimal good health ... they deserve it. Fixtures and bulbs manufactured by Vita-Lite or ZooMed provide excellent choices to offer your birds. 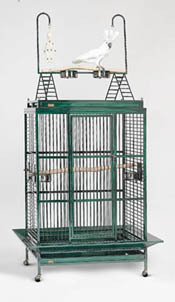 A & E Cage Company - Powder-coated Wrought Iron and Stainless Steel Bird Cages in all styles for all size birds. 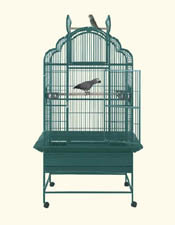 Avian Adventures by Midwest - Powder-coated Wrought Iron and Stainless Steel Bird Cages for smalll, medium and large birds. 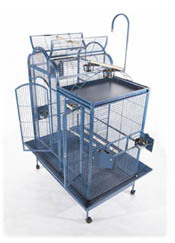 HQ Cages (Genuine) - Powder-coated Wrought Iron Bird Cages for Small, Medium and Large Birds. 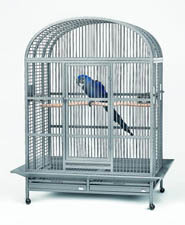 Featherland Cages - Stainless Steel Bird Cages and Powder-coated Wrought Iron Foldable Bird Cages. 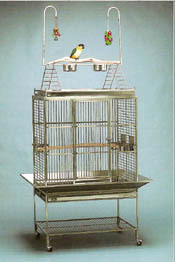 Freedom Bird Cages - Stainless Steel and Powder-coated Wrought Iron Bird Cages featuring the Freedom Buffet. Coming soon! 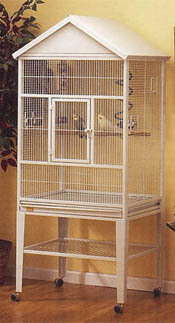 Kings Cages - Powder-coated Wrought iron, stainless steel, and new aluminum dome top, play top and flat top styles. Economy and Signature models. 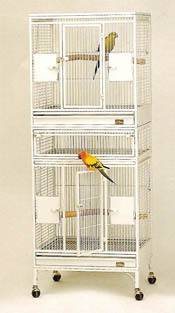 Marvelous Cages - New designer bird cages, innovative work of art styles, two-tone colors for small and medium size birds. Is your bird getting a good night's rest? Would a cage cover help? Check out Cozzzy Covers ... they are ideal! Don't buy those over-priced copy-cat covers ... Cozzzy's are the highest quality and priced right! Our huge selection of quality bird cages include: dome top cages, play top cages, Victorian bird cages, wood furniture-style cages, flight cages for small birds, small bird breeder cages and cages for larger birds with breeding box doors, stackable bird cages, double parrot cages, space-saving corner bird cages and new designs including fan top cages, split-level, and hexagon and octagon-shaped cages which are a perfect substitute for the less-safe round cages. And don't miss the new furniture-style cage ... its awesome! We have a great selection of beautiful stainless bird cages, too. A stainless steel parrot cage is the ultimate home for your bird. Don't miss our indoor and outdoor aviaries if you want to provide optimal space. As you'll see, we have all styles and large, medium and small sizes. Search bird cages.